I added cut up yellow onions and celery; sprinkled with my BBQ rub, and covered with an olive oil. You can use any seasonings of your choice. Cover with aluminum wrap with shiny side up, away from chicken, or cook in a pot with a lid. About 1 hr at 350F. The onions caramelize with the celery and become a delicious topping or side dish; I never make enough. Keeping the chicken covered helps keep chicken moist. After pulling out of the oven and letting it rest for 10 minutes, I had to check my cabinet for what olive oil I had used. It was a basil-flavored Olive Oil, which added a scrumptious taste! Once cool, you can remove from bone and either cut up to freeze, add to soups or serve just as it is. 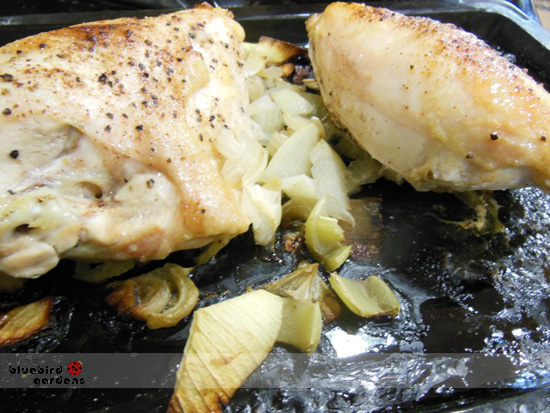 Store in juices to keep chicken moist when you heat it back up before serving. Note to self; cut up more onions and celery next time!